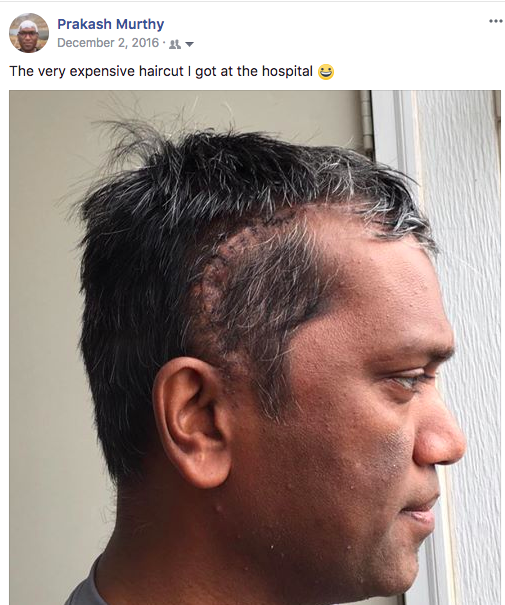 I was a member of a couple of Facebook Groups related to Glioblastoma for a few months. Recently I quit all of them after concluding that these support groups are more of downers than of ongoing positive value experiences. I want to elaborate on the whole experience and my decision to quit in detail here as I think it might be of value to fellow 'Cancer-ful' and their care-givers. 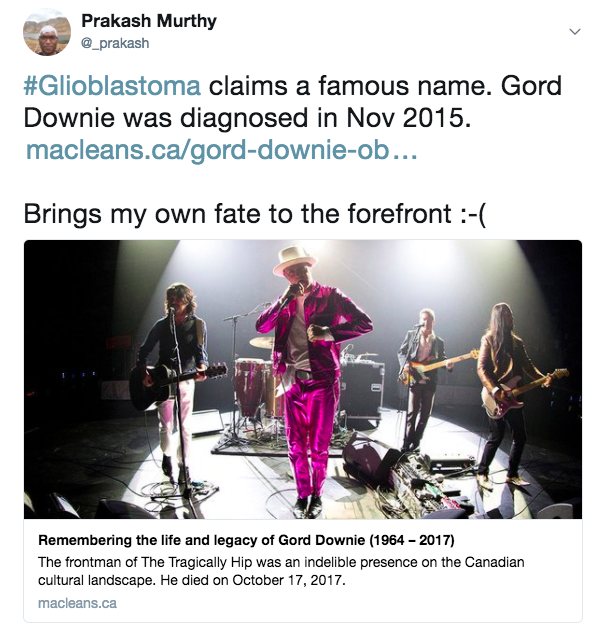 Back in October 2017, I got hit with having to face the threat of an early death on learning about Canadian rock singer-songwriter Gord Downie's death caused by Glioblastoma. I got to know of Gord Downie only on reading about his being diagnosed with Glioblastoma a few months earlier. I started following his news with a bit more interest since the news about the diagnosis was announced. His death from the deadly brain cancer - one that I had the misfortune to share with him - despite him being "a Rockstar with possibly the access to the best in GBM treatment" - as I thought of him - gave me a shock and made me look around for support to deal with the sense of impending doom. That led me to join a couple of facebook groups for people diagnosed with GBM, and their caregivers. The groups are of value as many people eagerly share their experiences with this dreaded disease. The members are only happy to answer any question people may have in this context. I learnt quite a bit through my interactions with other GBM patients and their families through these groups. People who go through craniotomies / have been diagnosed with GBM usually suffer from side-effects, ranging from very minor like one eye twitching frequently to very major and serious like being paralyzed completely on one half of the body. I am one of the few people who have been diagnosed with GBM but do not have any major side-effect since the original diagnosis. The above fact does not in any way save me from the fate of dying from GBM in a few months/years. There have been people diagnosed with GBM who displayed no major side effects after the initial diagnosis, and were dead in a few months/years. Alternate healing practices, and Natural healing, supplements, etc. are quite popular with this community. The Preston Robert Tisch Brain Tumor Center at Duke University in Durham, North Carolina seems to be the Gold Standard when it comes to treating GBM. One common question that keeps coming up on these forums - especially from the caregivers - is about the end-timeline. How does the end come for people diagnosed with GBM/deadly brain cancer? In response to this question, one webpage with a detailed timeline about the Progression of Symptoms is shared commonly. The details are gory and makes for one very depressing read. After my first seizure in January 2018, and subsequent realization that maintaining a positive attitude is key to surviving GBM, I decided to quit all online support groups related to GBM support. With hundreds/thousands of people with GBM in one place, it is but natural that there be a constant stream of bad news - about dying, suffering, bad results in regular MRIs, etc. Being exposed to such a stream of bad news on a constant basis is not a good thing for a GBM patient who is better off being ignorant of these happenings and maintain a positive outlook towards one's own future. So instead of depending on these online groups for support in my efforts at surviving GBM, I decided to get a few books about the anti-cancer lifestyle/diet and learn about what I can do within my capacity as a GBM patient and a regular person (Not a Medical professional) to build my immunity and help my body beat the tumor growth naturally. Surviving "Terminal" Cancer: Clinical Trials, Drug Cocktails, and Other Treatments Your Oncologist Won't Tell You About. - written by a long-time GBM survivor Ben Williams. 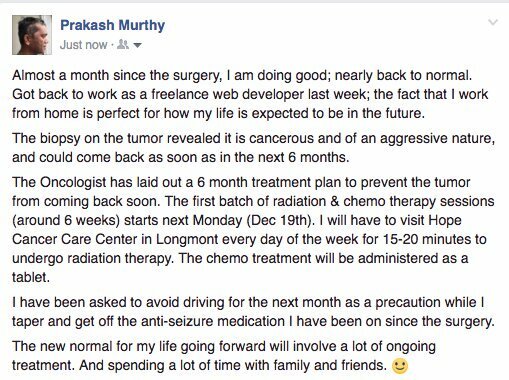 Life's Mountains - What A Brain Tumor Survivor Learned. - Written by a long-time GBM Survivor Cheryl Broyles. Her website also has a very informative pictorial guide to Battling Tumor from Multiple Angles. Radical Remission: Surviving Cancer Against All Odds - This book details 9 key factors that can lead to a spontaneous remission from Cancer - even after conventional medicine has failed. Anticancer: A New Way of Life - written by a Brain Cancer patient and a Medical doctor, details a anticancer lifestyle - something new for me.